The taxation details concerning investors have changed annually during the past years. Any major reforms have, however, not been made. From 2005 to 2011 the tax on capital income was levied at a flat rate of 28 %. After this, the capital income tax rate and the taxable part of the dividends received from quoted companies have been raised. Taxation on capital income has also become progressive, since capital income exceeding a certain higher level is taxed at a higher tax rate. Taxation forms a central part of the operating environment of an investor and, therefore, the predictability of the operating environment is important. The changes in taxation reflect on the popularity of certain investment and insurance products. Even though the primary goal of an investor is to make profit, striving for a lower taxation should not be the only motivation when making investments. Also other costs than those arising from taxation should be taken into account when making investments. 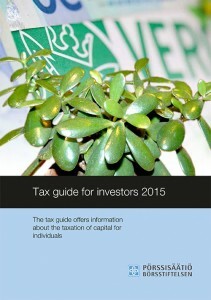 The Finnish Foundation for Share Promotion has published a Tax Guide for Investors since 1988. Information regarding the tax year 2015 has been updated by tax specialists Mr. Risto Walden and Ms. Niina Tuovinen from Bilanssi Oy. Additionally we have received assistance with the English translation from tax partner Mr. Kai Wist from PricewaterhouseCoopers Oy. Some changes have been made to the Tax Guide for 2015 due to the amendments in tax law which came into force as of beginning of 2015 and due to the changes in the interpretation of tax laws in the legal praxis. From the investor’s point of view the major changes in 2015 are the amendments in capital income tax rates. Where in 2014 the tax on capital income was levied at a tax rate of 30 % up to 40,000 Euros and at a higher tax rate of 32 % for the exceeding amount, in 2015 the higher tax rate was raised to 33 % and the limit for applying the rate was reduced to 30,000 Euros. You should note that this Guide describes the Finnish tax rules only concerning individuals who are resident in Finland. An individual is deemed to be resident in Finland if he has his main adobe in Finland or if he stays in Finland for a continuous period of more than six months. Individuals resident in Finland as well as resident corporate bodies and the estates of deceased persons are basically liable to tax in Finland on their entire income, whether derived from Finland or abroad (unlimited tax liability). Non-resident individuals and corporate bodies are liable to tax on their income derived from Finland only (limited tax liability). Tax treaties may also limit the Finnish taxation right. Even though this Guide is intended to be as up to date as possible you should be prepared to changes occurring in legislation or in the interpretations of the existing laws. It is recommended to follow possible changes from the mass media as well as from the Finnish Foundation for Share Promotion’s website www.porssisaatio.fi.